Challenge: go as long as I can without duplicating an outfit. Pants, skirts and sweaters I can cycle through, but I must wear them all before I cycle through again. Tops and dresses I can only wear once. Should I make this harder on myself and try not to wear the same piece of jewelry or an accessory twice? Place your vote. 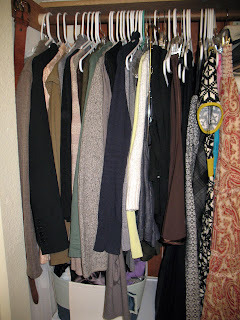 Here, for your viewing pleasure (cause I'm so sure it is), is a peek at my wardrobe. 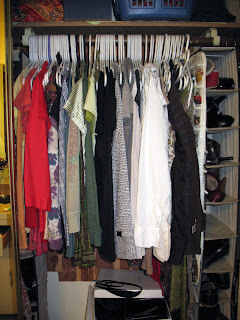 Right side of the closet has shirts, blouses, scarves and jewelry. And both sides have shoes. I know, mock if you will. Hat and necklace and shirt from Target. Jean jacket I stole from my mom while I was in high school. Pants from Limited cause they're one of the few places that makes pants that actually fit me and I nearly cried when they stopped making jeans of the same fit. Shoes are leopard print ballet slippers from a little store in Chico. Oh, and my new eco cup--a porcelin and silicone replica of the kinda of carryout cups you get at Starbucks. Minus the plastic/cardboard taste and a plus for not having to throw it away when you're done. I added it up this morning and I should be able to go 65 days without repeating an outfit. Add that to the $15 I'm going to be donating towards the Red Cross and while that may not make even a tiny dent in the massive recovery in Haiti, hopefully it will help. If you want to join for today, you can send a $10 Donation by Texting ‘Haiti’ to 90999. If you are skeptical you can check their website and donate there, on the phone, or the old fashioned way by mailing a check.